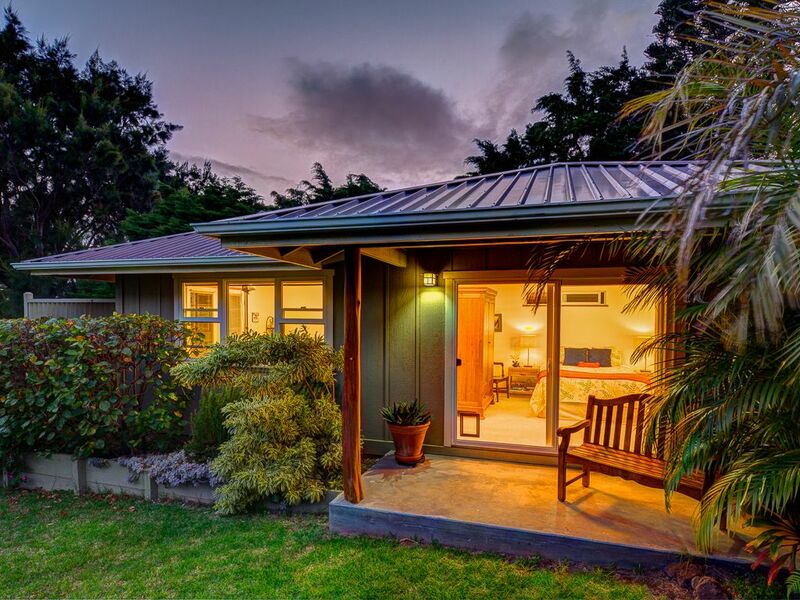 Hualalai Cottage, a stand-alone one-bedroom, 500 sq.ft. ohana unit is light, airy, and your perfect home away from home. It is located on the gorgeous, sunny side of upcountry Waimea, also called Kamuela, on the Big Island of Hawaii, within a few minutes of the beautiful Kohala coast. It is a perfect quiet, serene refuge or starting point for the wonderful attractions of our beautiful island. The cottage includes a queen bed, single airbed, tiled bathroom with walk-in shower, large walk-in closet, and a living-dining-kitchen room with all the amenities you will need for making simple, delicious meals. It is centrally located - 45 minutes from the Kona Airport and 1.5 hours from the Hilo airport. Our gorgeous beaches are 10-15 minutes down the hill. The picturesque town of Waimea is 10 minutes away, quaint Hawi and Honoka'a towns 30 minutes, and Mauna Kea 60 minutes. We are close to many restaurants and farmers' markets featuring our local fresh fruits, vegetables, and meats as well as wood-fire baked breads and other delicacies. Our 2200' elevation allows for cooler evenings and nights - perfect for deep and peaceful slumbers! There is a 'Hele On' bus ($1) which stops hourly in front of the property to take you to and from Waimea Town if you like. Check in time is 3:00 or later and check out time 11AM or earlier. We are flexible with these times whenever possible. An excellent book about our island with information on beaches, hikes, restaurants, and activities is 'Hawaii The Big Island Revealed,' by Andrew Doughty. There is a copy in the cottage for your enjoyment but you might consider purchasing your own before you arrive. Many of our wonderful guests have remarked that they loved their stay in the cottage so much that they wished they had booked a longer visit. We are fortunate to have had many of our guests return months later. You are welcome to inquire about 2 or 3 night stays. We live in the main house but most likely you will rarely see us. And while sincerely respecting your privacy, we are always happy and available to answer questions and give directions. Originally from Northern California and Arkansas, we have made our home here in this sweet town of Waimea since 2003. We love our little spot of paradise on the Big Island and welcome you to it too! We were attracted to this perfect location, weather, neighborhood, and elevation. Being close to lovely Waimea town, the coast, and many other destinations is a pleasure! Hualalai Cottage is a uniquely peaceful and private abode! All that you might need, more available if needed - please ask. Full kitchen - everything you'll need to make simple meals. We are happy to loan you other pots, pans, utensils if you need them. Reusable shopping bags are provided for your use. Intimate, cozy, with beautiful garden view. Guide books, Hawaiiana, bird and fish identification books, novels. Children's books available if desired. Water filter, floor & ceiling fans, vacuum, flashlights, ice chests, and blue ice provided for your use. Voice of Beauty Skincare luxurious, nurturing facials are available in our studio nearby by appointment. Super clean and comfortable detached cottage located close to Waimea's shops and restaurants and not too far from the Waikoloa Beach Resort area. this was our first visit to the Big Island and won't be our last - thanks to our hosts Loring and Lloyd for a true aloha welcome. We stayed at this cottage for a recent trip to the Big Island. I like cooler weather at night and this location was perfect - about 2,000 feet up the mountain. It's close to beaches- our favorite was Hapuna, about a 15 minute's drive down the hill. It's a relatively long drive (2 hours) to Volcano National Park, and much of the park was closed due to the government shutdown, so we concentrated on activities that are convenient to Waimea. We went zip-lining and flume-kayaking in Hawi, and hiked down to the Pololu and Waipio valleys. The cottage is great for this type of schedule - you can go zip-lining in the morning, have lunch and a nap at the cottage mid-day, and go to the beach in the late afternoon to play and watch the sunset. One evening we hiked from a local beach to the Mauna Kea resort and treated ourselves to a fancy meal with a portion of the money we saved by not renting an expensive resort condo. The cottage is clean and well-stocked. Bottom line - it's a great value for your money, with friendly and helpful owners who respect your privacy. Thank you so much for coming to stay in Hualalai Cottage and enjoying our gorgeous, beloved island! Please do return! Lloyd & Loring are fabulous hosts. They are warm and genuine. The cottage is in a great location; close to town and beautiful beaches and not too far to either Hilo or Kona. It’s well-appointed with the things you’ll need for your stay. The lanai is a perfect place to unwind and plan the next day’s adventures. We’re already thinking about when we can come back! Thank you so much! You were perfect guests and we hope that you return soon! Very accommodating and super friendly owners. This cottage offers all the privacy you need and an excellent location to town and beaches. Thank you, LJ, for coming to stay at Hualalai Cottage! You were a wonderful guest! The property and gardens are as beautiful as they appear in the photos. The property is near the owners house, but completely private. Notwithstanding, we were looking to gain some local knowledge, so we actively sought out Loring and Lloyd for information and advice. They are two of the kindest, warmest, helpful and fun people you could ever hope to meet. In short, a lovely place with gracious owners. Perfect. Thank you Beth and Doug! We loved having you stay in Hualalai Cottage and hope that you return soon! Loring and Lloyd’s cottage is beautiful, immaculate, and has everything you need plus more. We were very happy with the open, airy feel of the rooms, and the walk-in closet allowed us to keep our clutter out of sight. The location was great. The cottage is close to town yet near the beautiful white sand beaches to the west. Not only was the cottage lovely; Loring, the host, was terrific. We had a problem with our car rental that I was afraid would turn into a bad situation. Loring generously offered to help, and the problem was quickly solved. We highly recommend that you stay in Waimea at Lloyd and Loring’s cottage. You’ll be happy there! Thank you, Sue and Anastasio! We loved having you here in our community of West Marin friends! Rates are subject to change until reservation is confirmed. Your wonderful children of any age are considered a third person.